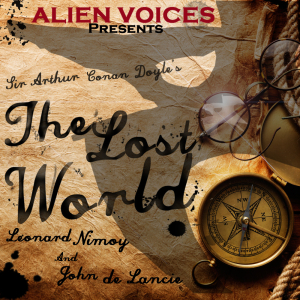 An Audio Drama production based on the novel “The Lost World” by Sir Arthur Conan Doyle. The novel tells the story of an expedition to a plateau in the Amazon basin of South America where prehistoric animals, such as dinosaurs and other extinct creatures, still survive. The novel also describes a war between Native Americans and a vicious tribe of ape-like creatures. The Professor Challenger characters were created by Sir Arthur Conan Doyle and appear in novels and stories by him. Use of the characters in this work by arrangement with Dame Jean Conan Doyle. The Lost World was produced by Alien Voices, incorporated. Alien Voices® is a registered trademark of Alien Voices, Inc.